There are many options when it comes to countertops. From laminate to polished marble and many options in between. We have listed several of the most popular choices below. At the bottom of the page is an at-a-glance chart comparing these options. Click the manufacturer’s logos for more information. Granite is the most used stone for kitchen countertops. Granite is composed mainly of feldspar and quartz. Some granite colors offer extensive veining and movement in it’s pattern. Marble, while offering unsurpassed beauty and elegance, is a softer material than granite or quartz. It is recommended for areas that are not used for food preparation. Most engineered stone is made from crushed quartz with an epoxy filler. Color and pattern movement beautifully mimic natural stone, and since it is made from quartz, it is harder than granite. It is also less porous and never needs sealing. Although Corian is the name most people associate with solid surface tops, there are many different manufacturers of solid surface products. Available in many different colors and patterns, solid surface tops have invisible seams and excellent reparability. The drawbacks are they can scratch and are more susceptible to heat damage. High Pressure Laminates (HPL) were the countertop of choice for many years. The main benefit of a laminate countertop is lower cost. While very durable, they can be damaged by heat and scratching. Typically used as a cutting or prep surface, wood tops are not recommended for use through-out a kitchen. Maple is the most-commonly wood, with walnut a close second. Island countertops are a perfect choice for wood. Wood tops also need to sealed periodically with mineral oil. While tile countertops have lost some of their popularity over the years, they offer an almost unlimited design potential. 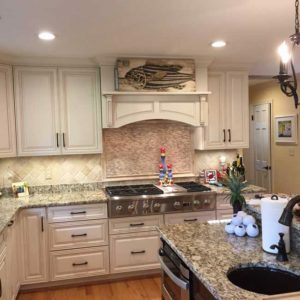 With a multitude of edging option, they can transition wonderfully between top and backsplash, but grout lines can be a magnet for food particles and do not offer an uninterrupted smooth surface. Swipe left or right to scroll through the table and see all of the countertop options.